The three-piece X-TEK FORM harness system provides the perfect combination of padding and adjustment for fit and comfort, along with quick-release buckles for the ultimate in ease of use. Heavy-duty stainless steel D-rings complete the system. 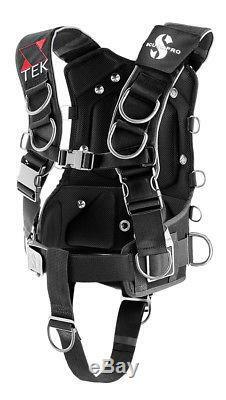 It is the ultimate full-featured, adjustable harness for technical diving. Padded shoulders and anatomical back padding deliver maximum comfort. Adjustable shoulder straps contribute to a snug individualized fit. Quick-release buckles on both left and right shoulders allow for quick and easy removal. 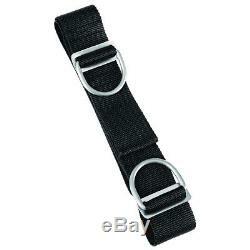 Four large stainless steel D-Rings on shoulder straps provide well-placed clip-off points. Can be used with an optional QR weight pocket system. Shown with crotch strap INCLUDED!!! Back Plate The X-TEK STAINLESS STEEL BACK PLATE features an ergonomic shape for maximum comfort, control and stability. It's the perfect additional to any tech or rec system. Made of corrosion-resistant AISI 316 stainless steel. A variety of options and clip-on points are provided for attaching a storage pack or other accessories. 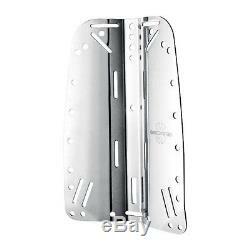 A back plate enables you to reduce the ballast weight you carry on your belt or weight system. Back plate weight: 5.3lbs/2.4kg. The item "Scubapro X-TEK Form Tek Harness with Back Plate NEW" is in sale since Tuesday, June 5, 2018. This item is in the category "Sporting Goods\Water Sports\SCUBA & Snorkeling\Buoyancy Compensators". The seller is "indianvalleyscuba" and is located in Harleysville, Pennsylvania. This item can be shipped to United States.